Homemade is Best is an audio podcast. It’s goal is to demystify the preparation of foods that we normally categorize as take out or restaurant dishes. Each episode we explain how to create delicious versions of your restaurant favorites, talk about cooking basics, food and cocktails, discuss our favorite food related books and cookbook. Most importantly, each episode we share some awesome recipes that we hope will inspire the listener to get back in the kitchen and cook. 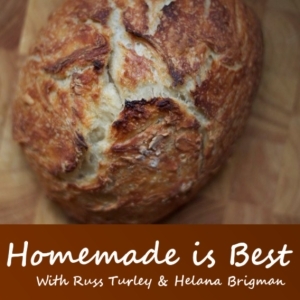 Homemade is Best is hosted by Russ Turley and food blogger and cook, Helana Brigman.